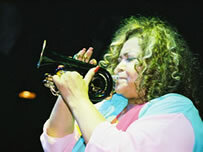 Alcione came to London and showed exactly why she had come – why she is called The Queen of Samba. She took the stage modestly and entranced everyone with her charisma. The simplicity of the singer, who is celebrating a 30 year professional career, could be appreciated even before the show. The day before the performance, Alcione gave an afternoon autograph session where people could meet her. Samba is Alcione’s territory, but Paraiso School of Samba – organisers of the event – had no difficulty integrating successfully into her music repertoire and the feel of the performance. “Everything went perfectly – even better than we’d hoped for” said Marcos Paulo, Paraiso’s singer. 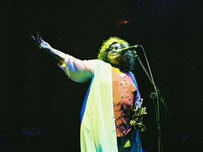 Although this was not Alcione’s first appearance in London, this show had a special flavour because, for the first time, Alcione was not appearing with her own band. The seven musicians who supported her were professional Brazilian musicians who play right here in London. “We had four rehearsals, but only the last was with Alcione – we were able to do this because the arrangements were sent over to London in advance” said Marcos. “The party was really beautiful. I’ve never come across a gathering like this in London before. The Bateria gave a wicked show and kept the energy up all the time” said Alcione after the performance. After the introduction of a few of the most important songs in her career, Alcione closed her show with ‘Samba no pe’ real Rio Samba School samba. On the one side Alcione, on the other side, the Paraiso Bateria – a combination which had the crowd dancing and singing the old songs of Brazilian carnival. The partnership between the School and the singer went beyond a performance. Alcione rewarded Paraiso with an Ala of Baianas for 15-16 year-olds for the 2003 carnival. The singer will be the President of the new Ala and responsible for the teenager’s costumes in white and silver, plus a Commissão de Frente of 12 children dressed in pink and green – the colours of the Mangeira School of Samba in Rio. She hopes to come in August to parade with Paraiso and to supervise the creation of her new Ala of young Baianas. Paraiso’s theme for the Notting Hill Carnival 2003 is Brasil, Paraiso dos Orixas – Brazil, Paradise of the Gods. Domingues de Estacio, singer of the Rio samba school Vivadouro hopes also to come to London to participate in Paraiso’s Carnival.